Note: The Creel family is making an attempt to preserve some of the stories and experiences of the original Creel siblings of Jim and Leora Creel. The following story was told by R.L.Creel to Rocky Creel and Bobby Downing at the Creel Christmas Gathering in December 2013. Bobby captured the story with his phone, and I have transcribed the story to paper. The following events took place in the early 1940's. Lemuel and I used to run an ice truck out there on Tri-Cities Beach Road. One year Lemuel couldn’t go, so I ran the route for him. I was driving there one day and looked over there, and there was a bunch of women standing in a window and they were naked as jaybirds. Of course, you know, I had to make three or four trips by there. Later on, I had to go in that house make a delivery there, and, boy, those women didn’t want to show their faces at all. At four o’clock in the morning, I went into many a house, moved stuff out of the top of the icebox where the ice goes, put the ice back in there, load it back down, and leave out. Back door was wide open, not locked at all. That was a common thing back in those days, ‘cause they didn’t want to get up at four o’clock in the morning. They trusted us ice men to come in, close the door, and make everything right. But they would have stuff in the icebox and you’d have to move it out of the way to put the ice in there. I was about sixteen years old…I graduated when I was seventeen so I was about sixteen. My uncle…cousin…first cousin (I’ll get it right in a minute)…he had a route out there. Then Lemuel took it over, and when Lemuel couldn’t go, then I went. We went all the way out Tri-Cities Beach Road and some of Baytown, too. We had most of those carhop places…what do you call them?...drive-ins. We’d load them up with ice, and then we started hitting the homes all the way out Tri-Cities Beach Road, so we had a pretty good route. We got the ice from the American Ice Company; they had a big plant up there. We’d go up there and back our truck up there and get four-five blocks of ice in three hundred pound blocks that could be cut into twenty-five pound blocks. Daddy worked up there at the ice plant, and I was up there many a night helping him... pull the ice out, run it through the cutter, stand it up, clean it up so people could come get their ice the next morning. So I’d work with him till about four o’clock in the morning, then go lay down and sleep a while, and then get up for school. Then when Daddy got down in his back and couldn’t pick up those three hundred pound blocks of ice and stand them on end…well, there’s actually a trick to it. If you get a (garbled) down there and step back and pull on it, it’s not too hard. But just to reach down and pull it up, it’s a heck of a load. A three hundred pound block of ice…we’d stand it up, run it through a machine, then have to lay it down and run it through again. We’d cut it into twenty-five pound blocks. Actually the top was fifty pound blocks, then twenty five, twenty-five , twenty-five on the bottom. So when the trucks came for ice the next morning, we had the ice all ready, and they’d buy it in three hundred pound blocks. You put it in their trucks and they’d deliver it to their homes. Lemuel and I delivered ice to the drive-ins; that was our big business. We had a good route. We did this all up through high school. Well, almost through high school. My last junior year before I graduated, I worked the summer months at the (M???) store in Pelly, selling paints and clothes. Then I went to my last year in school and graduated, and it wasn’t too long after that I went into the service. Daddy worked at the ice plant, and he was known as the engineer. He was the one who dropped the big cans in the water. He had about a fifty by hundred foot thing of ice water that you’d drop these cans into the water and then freeze them. You had a machine that pulled them up and the ice would come sliding off. Then you had to pick it up and run it through the machine. Daddy worked there for several years…up until I got out of high school. He hurt his back there several times, and I’d go up there at night and help him, lay down at four o’clock, sleep awhile, and get up and go to school. ‘Cause if you didn’t work you didn’t get paid. There was no salary. It was daily work…if you worked you got paid; if you didn’t work you didn’t get paid. I did that several nights during my senior year. After my senior year, I did construction work because I wanted to make more money. One day I came home, and the world was getting pretty hot (wartime), and my Uncle Keenan, he was already at Hondo (military base), asked me, “R. L., how high’s your number (military draft number)?” I told him it was coming up pretty soon to be drafted. He said, “They got a thirty day list here where you can go where you want to…so why don’t you come to Hondo? I can get you in with me in the motor pool.” I went and enlisted, and, sure enough, the put me at Hondo in the post office. I worked in the post office three years, and then after that they called us all in one day and said they were shipping us out. One busload went to the West Coast, one went to the East Coast, and I went to Wisconsin, up north. 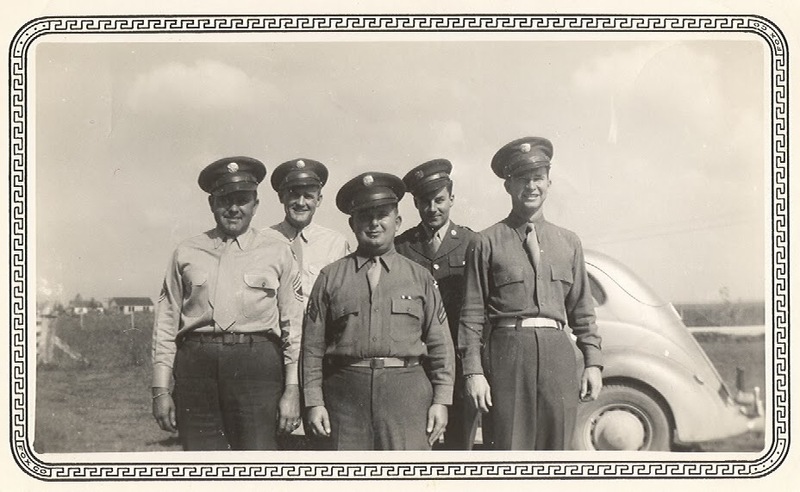 This was the Air Force (Army Air Corp in 1944)…I was in the ground crew; I didn’t fly. This was in ’44 and ’45. 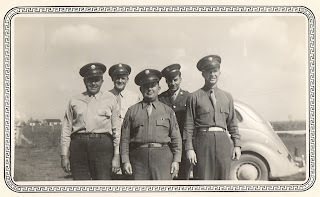 I went into the service in ’42. The ground crew did the service work…I didn’t fly.